I swear that there will never come a day when I’m blase about getting packages in the mail. Like you know how you see those ‘PR unboxing’ videos on YouTube where they hoard packages for weeks and then open them all at once on camera? Yeah… that will never be me. I tackle the FedEx man before he chance to step on the sidewalk and then I tear into whatever he’s bringing right there on the curb. 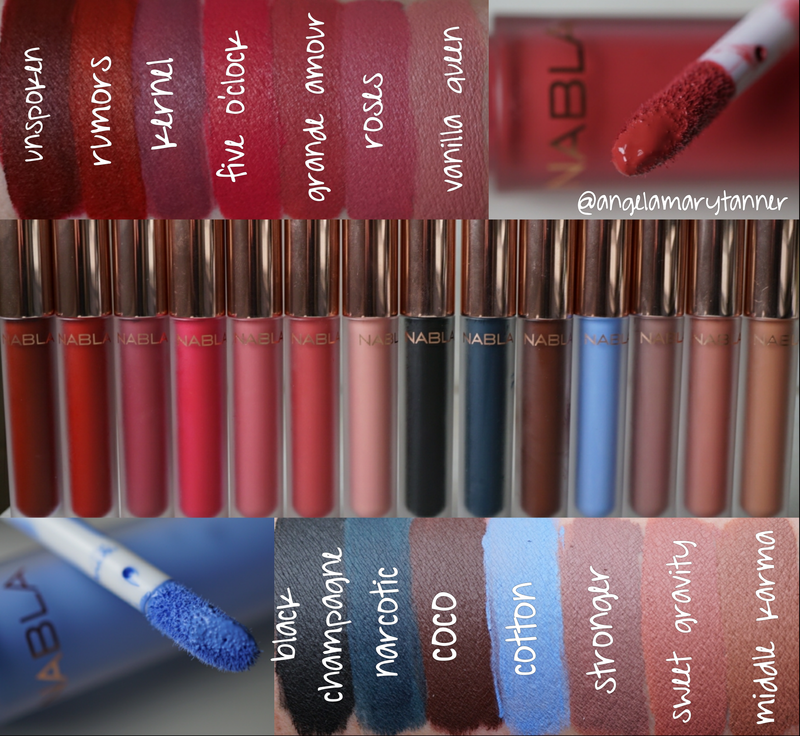 Anyway last week I got an email from NABLA COSMETICS asking me if I’d like to review their new liquid lipsticks. Hmmm… let me think… In addition to the new lipstick collection, they also sent a selection of other products from their line. In case you aren’t familiar, NABLA is an Italian company (finally something easily accessible for my peeps overseas). 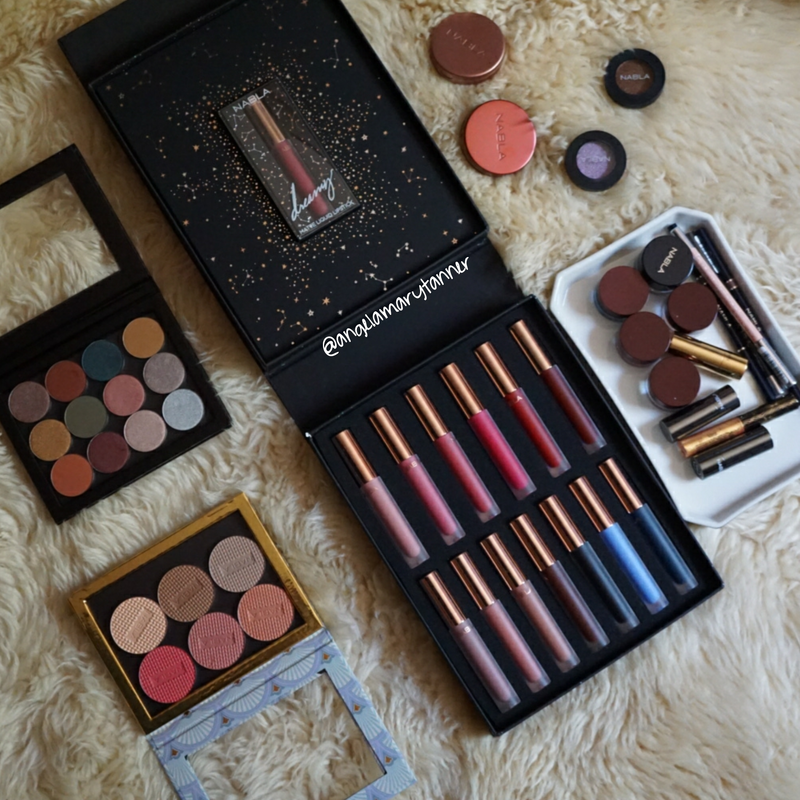 But fear not my fellow Americans, I’ve ordered from this company before, I reviewed some of their eyeshadows months ago, and it was a simple painless process. They run a lot of sales and free international shipping deals. And their shipping is lightening fast. If memory serves, the package that I ordered arrived with in two days. 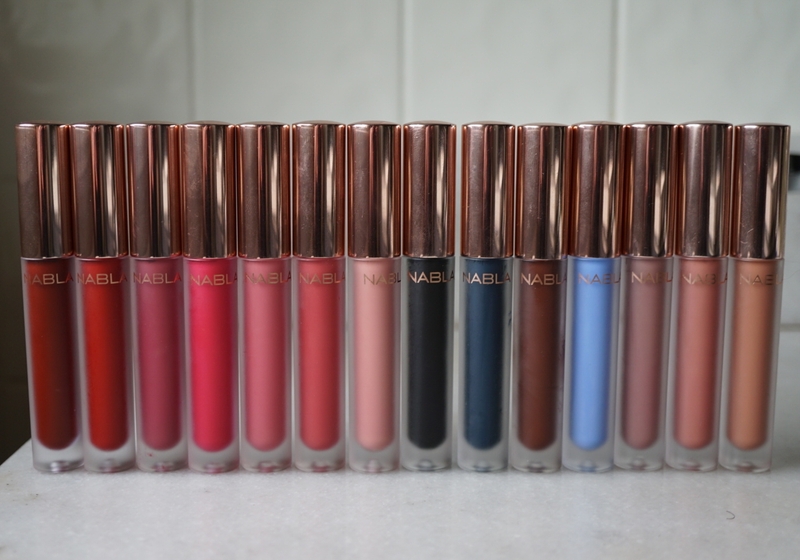 We’re going to start with the liquid lippies because they’re new but I’ve also got a lot of their eyeshadows that I’ll be swatching for you and also some blushes, highlighters, contour powders, cream shadows, brow products and a few other odds and ends that I’ll also be reviewing this month! 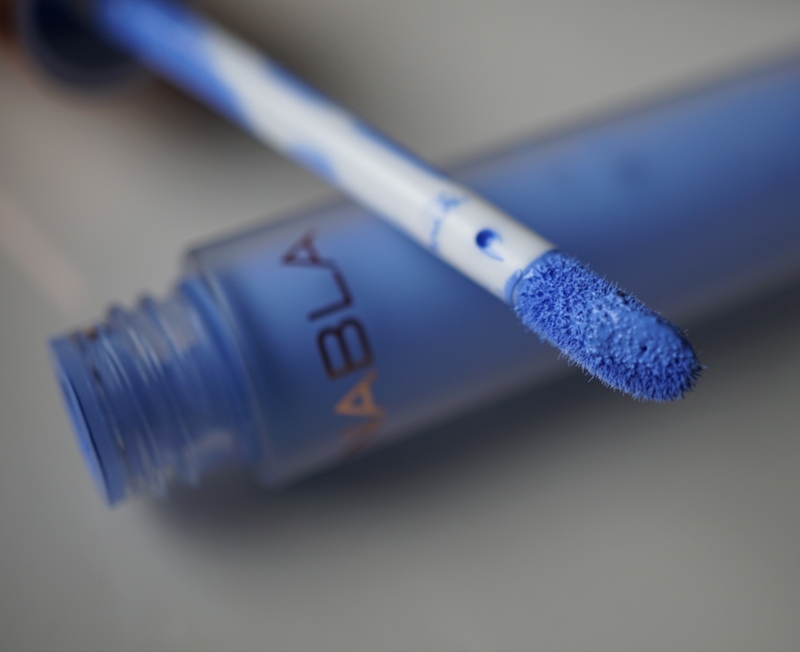 Nabla has a few special offers going on right now, including 50% off international shipping. The special box set that includes all 14 shades is on sale for €158/ $172 (reg €208, $226) and there’s also a few other smaller bundles that are discounted. The tubes are gorgeous, frosted glass with gold caps and they smell delicious, like vanilla and coconut. The wands are a basic doe foot applicator. I only gotten them a few days so I can’t really review the formula with any accuracy as I’ve only tried a handful of shades so far. They’re 100% vegan and they dry down to be transfer proof and they’re formulated with Shea butter for hydration. BLACK CHAMPAGNE is a soft matte black. COCO is a deep chocolate brown. And the pinks and reds! 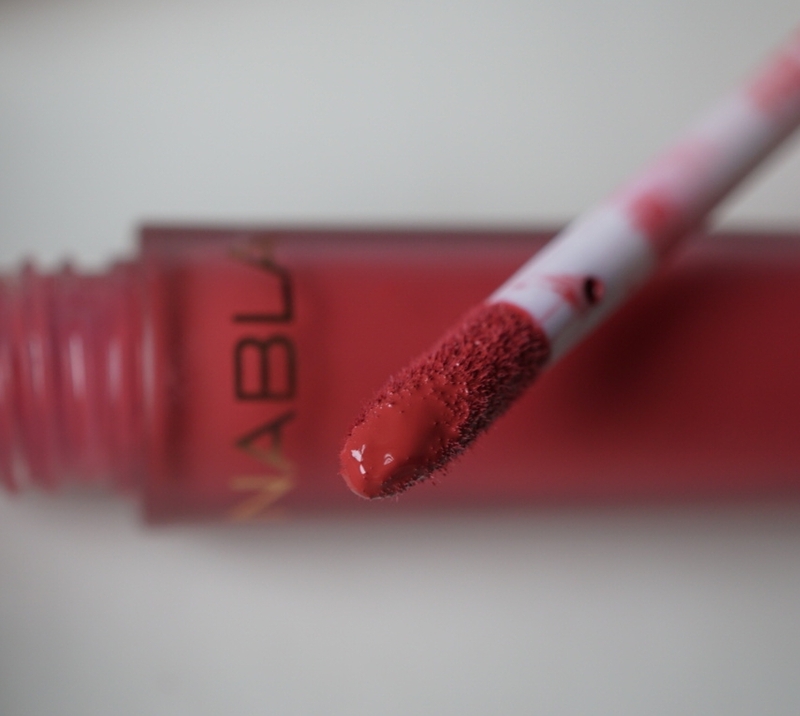 So if you’ve made it this far in the review, I feel that I owe you some honesty… I might quite possibly be the world’s worse person to review liquid lipsticks. In general I don’t care for them. I don’t like matte (on my lips). I hate my lips feeling dry. I’m always eating and drinking. And I don’t take care when I’m eating while wearing lipstick. You know what I mean. I’m not dainty about it. I eat like a Tasmanian devil. So keep in mind that this area of makeup is not my forte. The formula is on the thinner side and seemed to take slightly longer than usual to dry, not excessively long. Maybe a minute. Once it does dry, it is transfer proof and long wearing. I found the formula to be slightly drying, not terribly so. 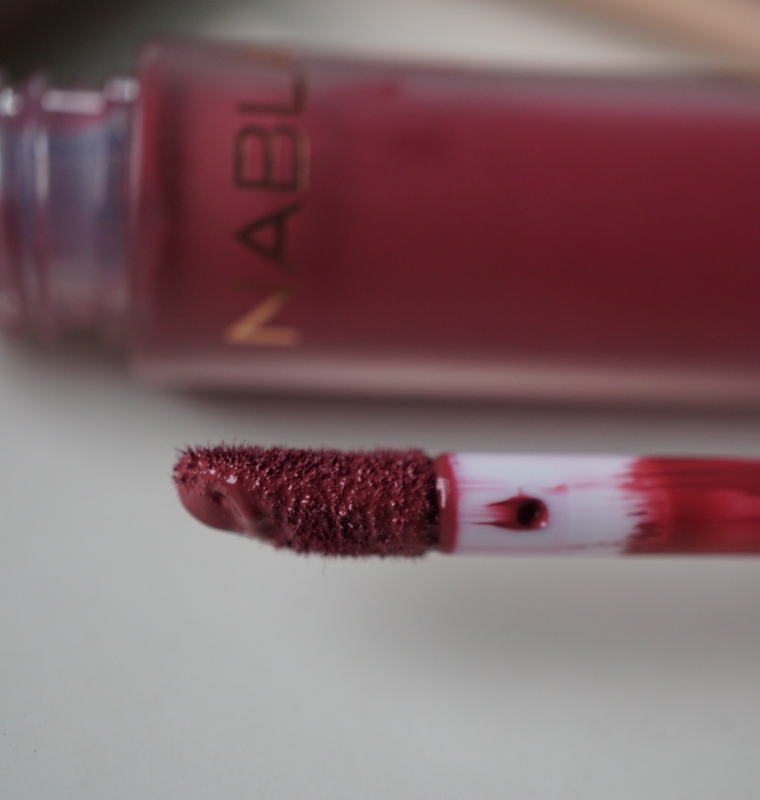 Just what you’d typically expect from a matte liquid lipstick. Overall they wore well and faded evenly but after eating, I did notice a bit of the ‘ring around the lips’. But don’t forget what I said earlier, I eat like a rabid dog. UNSPOKEN is a deep ruby red. 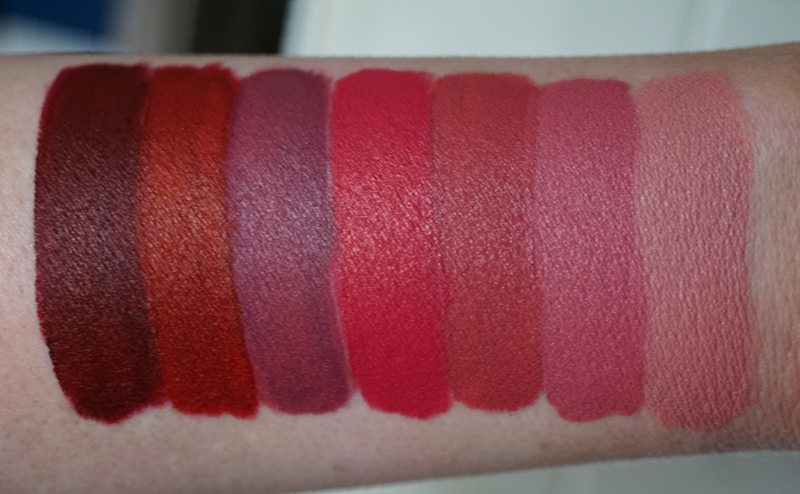 RUMORS is a true red matte. KERNEL is a plummy brown. GRANDE AMOUR is a rosy red. ROSES is a rosy pink. VANILLA QUEEN is pale peachy pink. 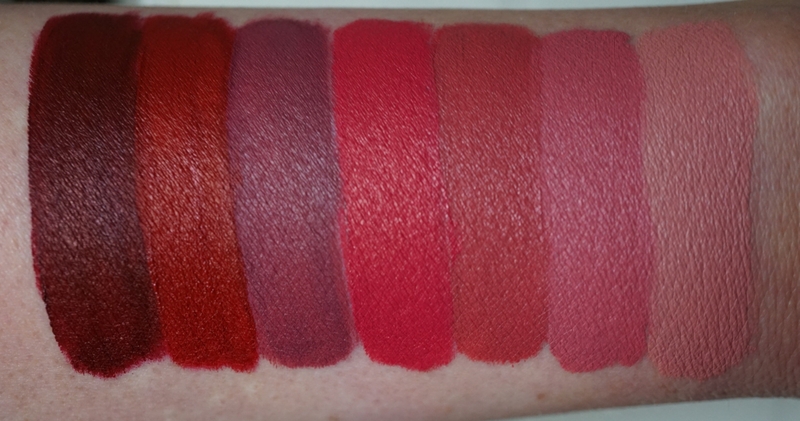 The darker shades swatched a little patchy but they applied fine on my lips. Nice and opaque, not streaky. 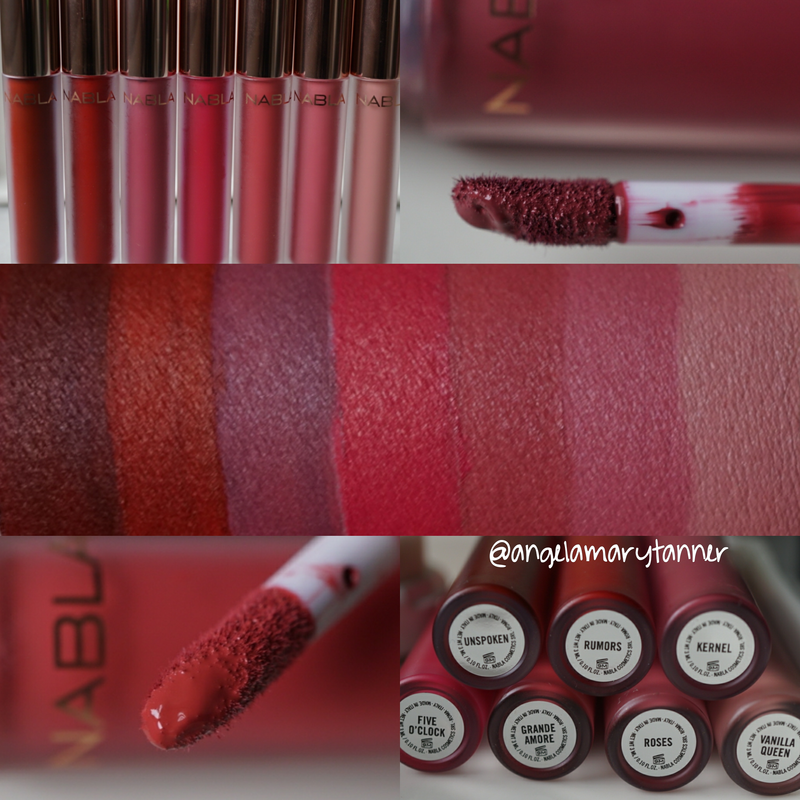 I’ve heard the formula compared to Limecrime and I agree that they’re similar. And the scent seems familiar to me. I want to say that it’s similar to Jeffree Star but I might be crazy. I think that liquid lipstick formulas are extremely subjective. What one person loves, someone else hates. 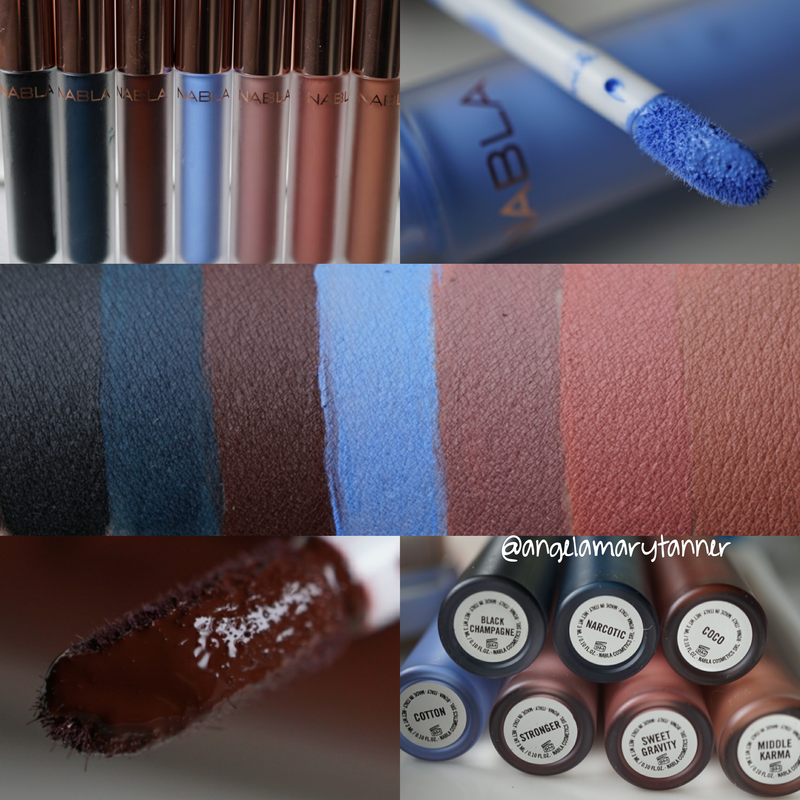 If you’re a liquid lipstick junkie then I’d definitely recommend picking a few up. Personally I enjoy their neutrals the most specifically ROSES, VANILLA QUEEN, SWEET GRAVITY and KERNEL. But I’m never going to wear blue lipstick in a real life situation. It’s just not my thing. If you’re on the fence, I’d recommend checking out some more reviews. 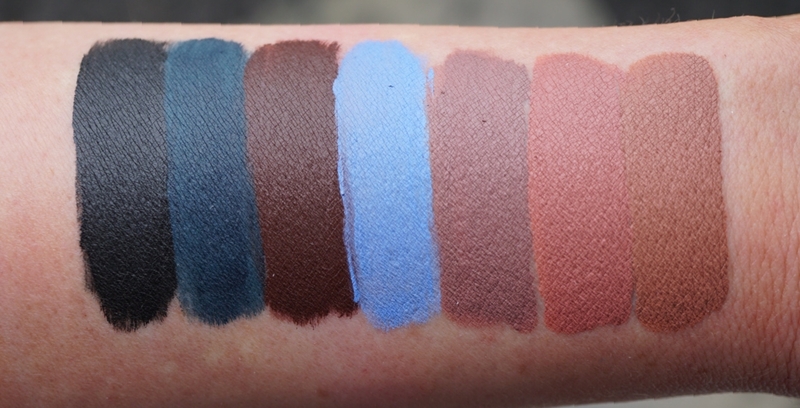 I apologize that this post wasn’t more informative but hopefully you still enjoyed seeing the swatches. If a lot of you are really interested, I’ll send a few of them to Em. She’ll be able give you a much more intelligent review and maybe a lip swatch or two if we’re good. I promise I’ll do way better with the eyeshadows, blushes, brow products and liners! 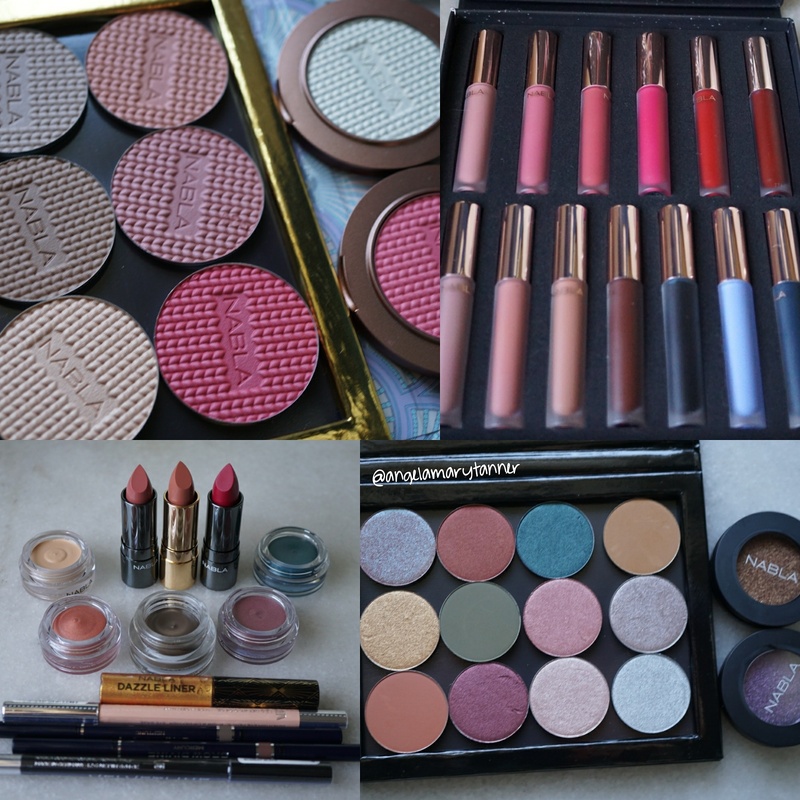 My eyeshadow post will be next. 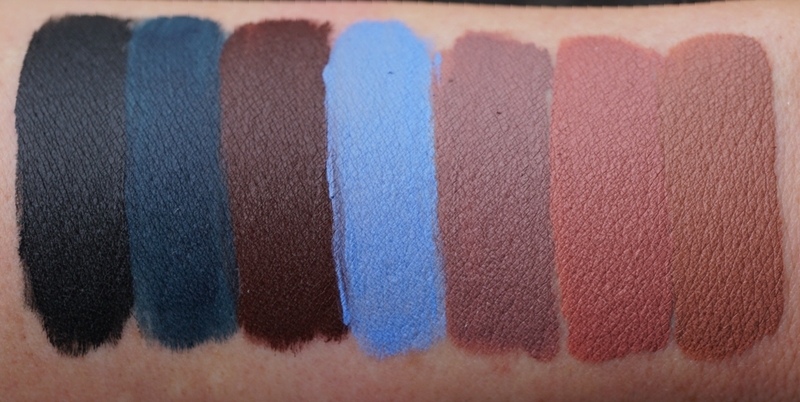 Next Sonya Esman x ColourPop Cosmetics Collab swatches YouTube Vid!